I saw in the news today that Federal animal health officials are warning that Chinese made jerky dog treats (sweet potato, dried fruit, duck, and chicken flavors) are causing illness and pet death. The story I read in TIME cites that over 3,600 dogs and 10 cats have become ill, while 600 pets have died after eating these jerky treats. After running many tests it is still unclear what is making pets sick. There was a different incident last January when a couple well known brands of chicken jerky treats were removed from shelves voluntarily over a scare they contained unapproved antibiotics. Please, if you feed your dog or cat jerky treats check where they were made (for those you have in your home now and before buying any at the store). It is always better to feed your pets as naturally as possible, and to know what kind of quality control the brands you use have in place for food safety. Given the multiple scares, it is probably better to not feed your pets this kind of jerky treat. If your pet has become ill from eating jerky treats please take your dog to the vet and contact the Food and Drug Administration. The FDA lists a few things you can look out for in your pet should they consume bad jerky treats: decreased appetite, decreased activity, vomiting, diarrhea, increased water consumption, and/or increased urination. Some cases involve animals with other symptoms including convulsion, collapse, or skin problems. 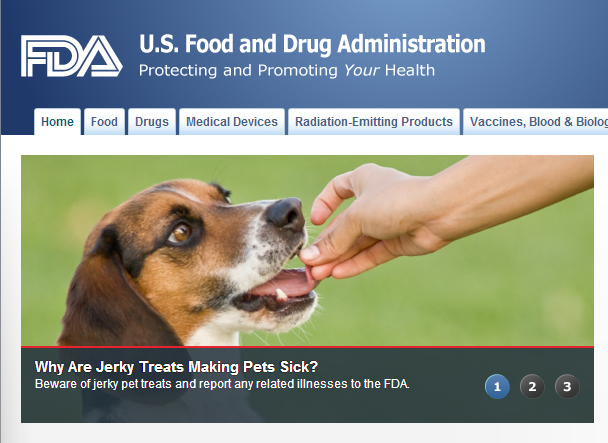 If you suspect that jerky treats made your pet ill the FDA may want any leftover treats, or the packaging itself, for testing. You can read the story in TIME or there is a lot of good information on the FDA’s website.